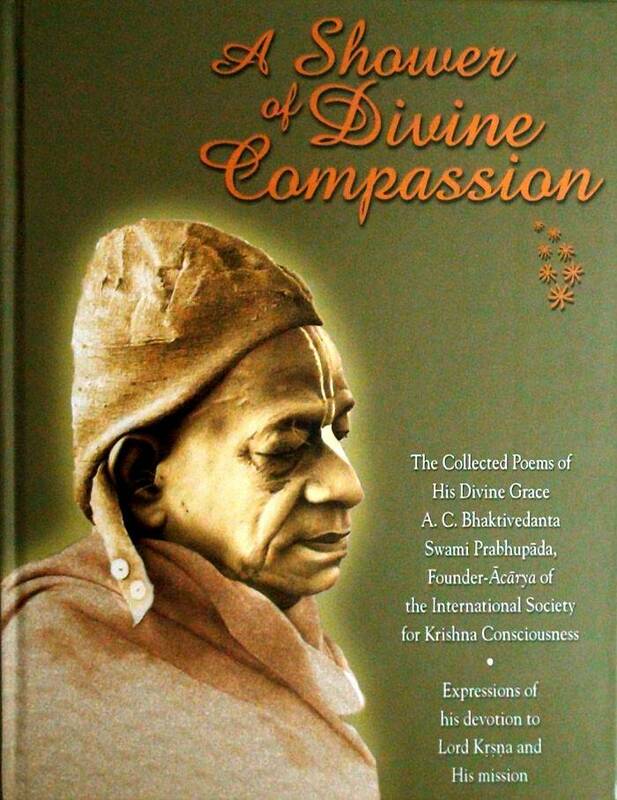 Personally I am so happy to see the Bhaktivedanta Book Trust (BBT) publish this beautiful and complete collection of the transcendental poems written by His Divine Grace A.C. Bhaktivedanta Swami Prabhupada. "Kavi" or poet is one of the 26 qualities of a Vaisnava (devotee of Lord Krishna) and in these transcendental poems Srila Prabhupada exhibits his ability as a poet in a most brilliant way. Prabhupada's poems expose his intense eternal love and devotion to Lord Krishna, the transcendental cowherd boy playing in beautiful forests of Vrindavan. They show his personal and intimate connection with the preaching mission of his spiritual master, Srila Bhaktsiddhanta Sarasvati Thakur Prabhupada, his dedication to the orders of his spiritual master, and his personal distress at what happened in the Gaudiya Matha after the disappearance of Srila Bhaktsiddhanta. I am unable to properly express the beauty, majesty and power of A Shower of Divine Compassion. I spent a couple of days reading it and through this book Srila Prabhupada gave me such an increase in inspiration and enthusiasm to push on, to try and advance in Krishna consciousness, even though there are so many obstacles on the path. I believe this book is an essential read for any follower of Srila Prabhuapda. These poems of Srila Prabhupada give an intensely personal glimpse into Srila Prabhupada's unfailing dedication to the mission of Lord Caitanya and his spiritual master and his direct, personal relationship with Krishna, the Supreme Personality of Godhead. Srila Prabhupada's poems are a source of great inspiration for us as we can see that he also had to face many of the very same problems we are facing within ISKCON now when his spiritual master's preaching mission, the Gaudiya Matha, disintegrated after the disappearance of Srila Bhaktsiddhanta.